Should I stop using them considering the risks? With how small the current is running between the cart and the system I'd hardly expect any catastrophic failure as a result of that. Unless they're running those 3V chips at 5V, and not using a voltage regulator, in which case I'd be a lot more concerned. If the chip fails faster when using 5V, either it would fail immediately or over time. Clearly, there's no immediate failure when using the cartridge normally. I believe the EMS cart has a voltage regulator. I know the bootleg carts don't most of them time. What I've found is that while you can read from the bootleg carts, you can't write to the flash while the supply voltage is 5V. A crude way of dealing with that is to add a diode across the supply line, which some of these carts helpfully include a pad for on the board. The diode drop just barely brings the voltage below the absolute maximum rating, and you can flash the flash chip. Then there's long term use. I think the CMOS output drivers couldn't care less about the supply voltage. However, a read operation in a flash chip is ever so slightly destructive to the data, because it depletes the charge in the floating gate of the cell. This is true for flash chips under all conditions regardless of voltage conditions. It's possible that using a 5V supply makes that problems slightly worse. But you're still probably looking at many years of data retention. All in all, I wouldn't worry too much. However, a read operation in a flash chip is ever so slightly destructive to the data, because it depletes the charge in the floating gate of the cell. This is true for flash chips under all conditions regardless of voltage conditions. I'm about 95% certain that is simply untrue. All of the sources I have seen have indicated that the process by which the floating gate discharges is a function of temperature, time, and (if relevant) radiation, not what external voltages that are within the specified operating parameters. Using a 3V IC on a 5V system will stress both the IC's overvoltage protection diodes and the SNES's address/data bus drivers. Using a 3V IC, supplied by 3V, in a 5V system, without current limiting... that will stress the driver and the overvoltage protection diodes. In the case of CMOS systems (like the GB and SNES), that's definitely a problem. For a 3V IC, supplied by 5V, that will cause a whole different set of weird failure modes, but at the beginning, they "ought" to be limited to destroying the 3V peripheral. (Once the 3V peripheral is sufficiently damaged it could become a short, then damaging the 5V driver). One of the weird failure modes is what I'm referring to in my tangent related to that PDF: bits that were programmed may read as not, randomly. Well, I have two answers so far: "It'll break your Game Boy" and "Sure, go for it". Which one is correct? The Chinese bootlegs have a gloptop mapper, a 3V ROM chip, and a RAM chip. As lidnariq explained, the difference is whether it's a 3V chip fed a 3V supply voltage or a 3V chip fed a 5V supply voltage. Different scenarios. Are my carts in the "both'll die" camp? or the "only the cart'll die" camp? If you don't see any small part that looks like this, I'd bet it's in "3V part will eventually die, but no damage will happen to the system in the mean time"
Those pirate carts are of the type where the cartridge might die eventually. EMS64 is probably of the other type. I've heard people complain that it drains the Gameboy's battery, and is causing crashes/power failures, especially on Gameboy Pocket which is using AAA batteries instead of AA. Leakage through the protection diodes could be a likely cause. 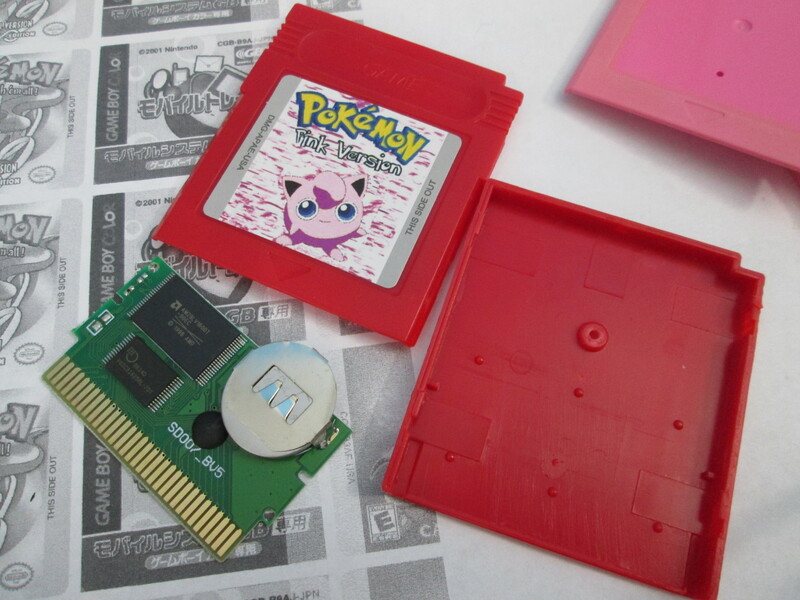 I haven't heard about permanent damage to the CPU from using an EMS64 cart, though. EMS64 is probably of the other type. I've heard people complain that it drains the Gameboy's battery, and is causing crashes/power failures, especially on Gameboy Pocket which is using AAA batteries instead of AA. Leakage through the protection diodes could be a likely cause. I haven't heard about permanent damage to the CPU from using an EMS64 cart, though. Who wants to buy an EMS64 cheap? Seriously, I've been meaning to get rid of that POS (which I've never used, BTW, I was always putting it off because setting it up sounded like a chore) ever since I bought a GB Everdrive a couple years ago.